It’s not that I haven’t been writing! My words are being seen now on Praying True, the global group on Facebook for blessing our precious planet and its waters that I began with my virtual – but very truebluefeeling – friend from New Zealand, Jane Cunningham. In addition, I’ve been invited to write for a new online monthly magazine that inspires me. Called “Creative Sacred Living,” it’s been birthed by another online friend from my intuitive painting world. Please consider subscribing because I think it’s, quite frankly, AWE-some. And it even inspires me to paint brand new images JUST to illustrate my writing. I wrote for the first issue last month. My column, ‘In my Shoes’, appears for the first time later this month. 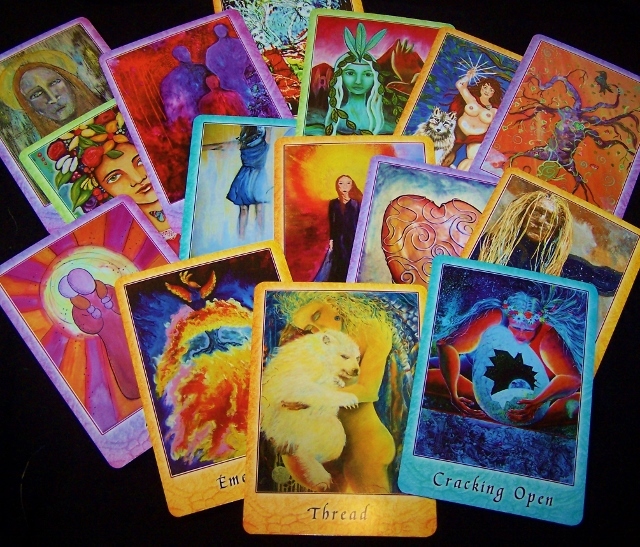 Only two more decks remain in my stash of the Fearless Sisters Oracle Deck – Awakening to your Divine Self. We hope to do a second printing but don’t know how soon, so if you’re thinking about owning a deck for yourself, let me know. The cards inspire, support and transform. Wonderful stories continue to pour in. You can read one of mine here! And the riches of Spectrum. Oh my goodness. Each month seems more amazingly full of insight and encouragement than the last. Though it’s a ten month course weaving threads of Art, Body and Nature, it could take years to do justice to all the materials offered. And it’s colorful and approachable too. My teaching session,” Asking Fear to be your BFF”, arrives in mid June along with four other topics related to the theme: Activate. I re-listened to my audio and was quite impressed. Really! I encourage you to subscribe. Even though we began in March, you’ll receive all the prior lessons. I haven’t opened up May, yet, so you’ll be in good company! Recently, I accepted my own challenge to pray at the edge. I went to the beach and made my first Waterwheel. What a precious process. Thank you Pixie Campbell for designing this mandala form and making the connection between sacred geometry and shifting energy on the planet. Thank you Jane Cunningham for posting this on Praying True and bringing this new artful prayer practice to our awareness. I loved doing it. I kept it very simple since it was the first time and at a public beach but the rhythm of making the six petals and the concentric circles felt ever so good. I decided to place the wheel in front of a burned tree – probably a “recycled” Christmas tree – that someone had planted in the sand as a sentinel of sorts. 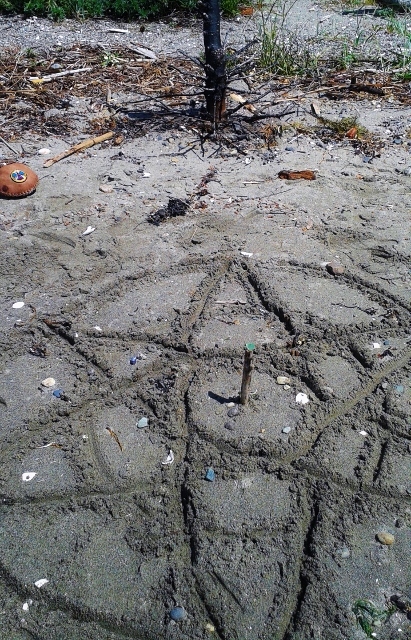 I placed a shell and a piece of green beach glass in a crook of a branch of that tree and drew the mandala at the base. I found myself drawing it counterclockwise and said to myself: Oh yes, the moon and alternate reality are guiding me. When I finished drawing it, I put the drawing stick in the center and placed another piece of green beach glass on the top of it. That repetition felt auspicious somehow – like the concentric circles -ever amplifying/expanding. Then I walked counter clockwise making prayers for water and plants at the point of each petal, scattering herbs from both northern and southern hemispheres gifted to me a few days ago by master drummer healing friend from Cyprus, Heleniq Argyrou. Water and plants – at the tip of each petal, I added different embellishments which are already lost to the ethers – all blessings embued with awe and gratitude for this abundant web of water and plants on which we depend. Author Daniel Quinn recently brought this fact to my awareness: all creatures who live by eating do so by the largesse of plants. Think about that…for me that’s a WOW. Summer solstice is coming soon. I invite everyone to make a waterwheel wherever you live. I’ll speak to that global invitation in my next post. 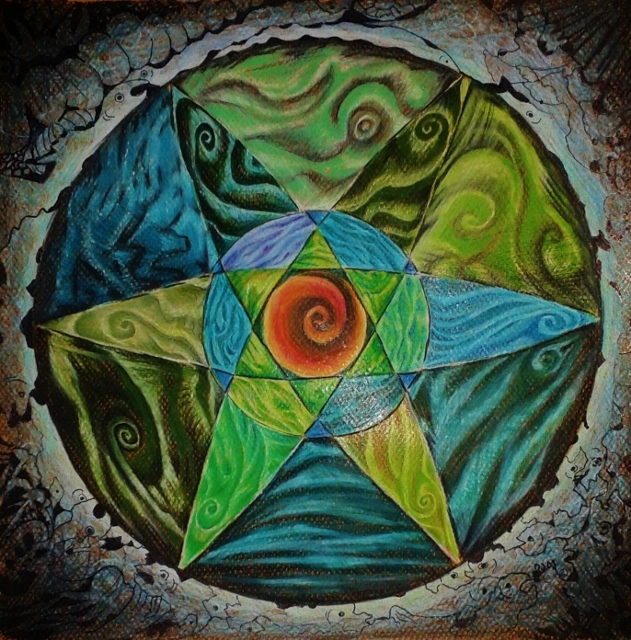 This entry was posted in Uncategorized and tagged CreativeSacredLiving magazine, Fearless Sisters Oracle Deck, global blessings, global prayers, Heleniq Argyrou, Jane Cunningham, mandala, Praying True, sacred geometry, Spectrum, summer solstice, Waterwheel mandala. Bookmark the permalink. I will be thinking of you Deborah on the Solstice, and wish you continued awakenings on your blessed path!